Mine CEO Points Fingers As He Details Blast During an invitation-only, "informal" conversation, Don Blankenship advised reporters to focus more on federal regulators in their coverage of the Upper Big Branch mine disaster. Blankenship also provided more details about Massey's view of the deadly April explosion. Coverage of mine safety and what led to a blast that killed 29 in West Virginia. Massey Energy CEO Don Blankenship assembled a selected group of local and national reporters Friday at the company's regional headquarters on a forested hillside in Julian, W.Va.
And for two and a half hours, despite dozens of wide-ranging questions, Blankenship kept returning to several central themes: news stories about the coal mining giant unfairly suggest blame; reporters should focus more attention on the failures of federal regulators; and those regulators are keeping Massey from operating safely and determining the true cause of the massive explosion in April that killed 29 mine workers at the company's Upper Big Branch mine. The setting for the extraordinary gathering was a dark wood conference room with a massive and matching table in the middle. Paper placards indicated the company's broad reach: The Washington Post, The Wall Street Journal, The Associated Press, NPR and Bloomberg. Local reporters were also invited, including Ken Ward, a tough coal country reporter from the Charleston Gazette. The reporters were told of the invitation-only gathering less than 24 hours before. The "informal" conversation with Blankenship would have no set time limit and only one forbidden subject: the reported possible sale of Massey Energy. Everything else was on the table, along with the fruit, nuts, chocolate and sweet tea the company laid out for its guests. Blankenship sat at the head of the table and said he might have some questions, as well. "And I may, if it's all right, ask you all some questions to see whether our communication efforts are working," Blankenship began. But he made it clear that Massey's communication efforts didn't seem to be working, noting news stories that "pointed fingers" at Massey, Blankenship and other company executives, some of whom were sitting and listening from the perimeter of the room. The underdog in this situation is not the government. The underdog is not MSHA. The underdog is the coal industry and the [coal] companies. "What we're trying to do is avoid the focus on culpability," Blankenship explained. "The focus ought to be on the physics, the chemistry, the math, the science, to figure out what the source of the explosion was." But Blankenship persisted in his own relentless finger pointing, repeatedly urging the summoned reporters to focus attention on the safety inspectors, officials and mine disaster investigators with the federal Mine Safety and Health Administration (MSHA). "The underdog in this situation is not the government. The underdog is not MSHA," Blankenship asserted. "The underdog is the coal industry and the [coal] companies. So, to the extent you want to root for the underdog you need to root for the companies, because we're definitely powerless when it comes to the government." 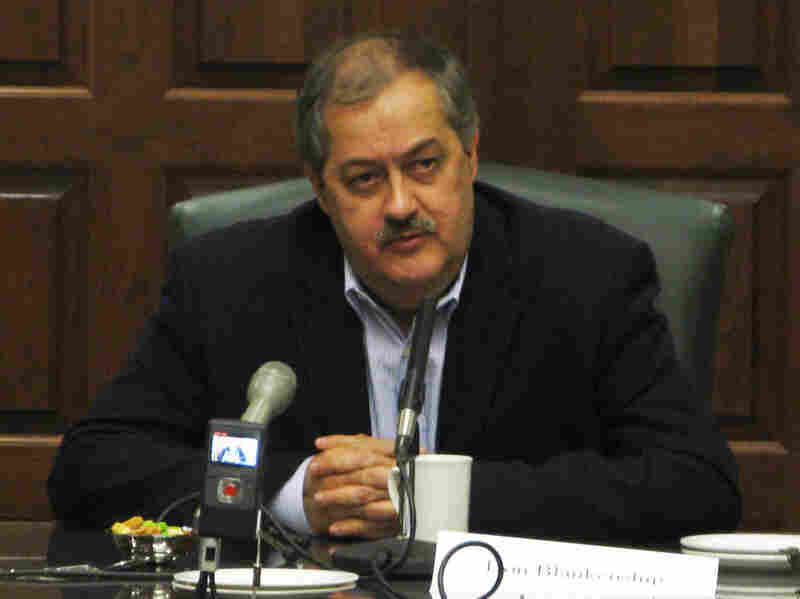 Blankenship blamed MSHA for the ventilation problems at Upper Big Branch before the fatal explosion in April. He said the agency kept Massey from using coal dust scrubbers on mining machines, which are designed to filter out dust particles that can cause black lung and accelerate and spread mine explosions. And he said MSHA's disaster investigators were essentially investigating themselves given the possibility that failed regulation may have contributed to the tragedy. MSHA points out that mining companies are responsible for developing workable ventilation plans, which direct airflow underground and sweep away explosive and toxic gases. "The problems come from the mine operator failing to follow its plan," says Amy Louviere, MSHA's spokeswoman. Louviere also says scrubbers have not been approved for use at some Massey mines, because they did not adequately control coal dust. And federal law gives MSHA the responsibility for investigating mine accidents. Massey and MSHA have been sparring about the company's own disaster probe, which is also required by federal law. MSHA has yet to approve Massey's investigation plan, but the company's experts have been allowed to observe the official investigators and they've had access to some of the data gathered so far. None of this is especially new, but Blankenship seemed to hope that if he repeated those accusations enough reporters would begin to examine them, shifting some of the spotlight from his company to federal regulators. But some of the reporters wanted to know more about something that is relatively new: Massey's claim that natural gas, and not methane, fueled the massive blast. Methane is a primary component of natural gas, according to the Natural Gas Supply Association, but natural gas also includes other combustible gases. And natural gas can seep into mines from beneath coal seams and through cracks in a mine's floor. Methane is contained in coal seams and is "liberated" when mining machines cut into coal. Both gases are explosive, but methane is a constant problem in gassy mines such as Upper Big Branch. Methane requires constant vigilance and federal regulations require a number of safety procedures to diminish the threat of a methane explosion. An explosion fueled by methane from a coal seam would suggest the company might not have taken all of the proper safety measures. But Blankenship suggests there's little the company can do to prevent an explosion fueled by natural gas. Infusions of the gas are relatively rare. "I don't know that anyone could foresee that natural gas coming out of the floor at [Upper Big Branch] was going to be ignited and cause an explosion," Blankenship told the reporters gathered on Friday. "Most everything you do is guarded against the things that happen lots of times," Blankenship continued. "The laws and regulations and things that miners do every day are more in guarding against coal bed methane than they are an inundation of natural gas." Massey first introduced the natural gas theory 10 days ago in a local television story. Blankenship made it part of a speech this week at an industry conference in New York. But Upper Big Branch and other nearby mines have experienced natural gas infusions. Two incidents at the mine in 2003 and 2004 triggered assessments and recommendations from MSHA, which were discussed with Upper Big Branch officials. The company's own mine managers considered drilling degasification wells to drain off natural gas, according to a MSHA memo obtained by NPR. Another memo listed eight steps Massey could take to guard against natural gas infusions. But neither Massey nor MSHA will say it actually implemented any of the actions. Blankenship said he thought mine managers concluded they could address the natural gas threat with more ventilation, more directed airflow in the mine, which would also sweep away methane. Massey executive Chris Adkins added that locating natural gas deposits was "like finding a needle in a haystack" so the degasification drilling option was abandoned. The explanation doesn't satisfy Davitt McAteer, who heads an independent Upper Big Branch investigative team assembled by former West Virginia Gov. Joe Manchin. "I think that the question is how did they address that?" McAteer asks. "And what kind of engineering and what kind of factual basis did they use to make the determination that ordinary ventilation would take care of it?" McAteer sides with Blankenship on one point. "I don't disagree that facts should be first," McAteer says, adding that assigning culpability comes after the fundamental facts are known. But he also believes Massey's conclusions about the blast are premature because Massey has yet to conduct its own investigation. Still, Blankenship said the company's experts may be ready to report their conclusions about the cause of the explosion in a few weeks. State and federal investigators don't expect to have their reports ready until next year. Blankenship did ask one of his own questions during the meeting with reporters. During persistent and probing questioning from Ken Ward of the Charleston Gazette, Blankenship fired back. "What do you think happened, Ken?" Blankenship asked. Ward considered an answer for a moment, and then responded, "I might be able to answer if you would provide the documents I've been seeking [from Massey]." Blankenship said he wasn't sure he could turn over the documents, which further describe the discussions between MSHA and Massey over natural gas infusions. As the event concluded, Blankenship told the group, "We hope you leave here with some idea that there's a lot to the story." A half-hour later, MSHA issued a new list of 14 coal mines with chronic and persistent health and safety problems. Massey's Upper Big Branch mine was on the list.